Few will argue the importance that food plays in any culture; nourishment of the body as well as the mind is essential for human development. 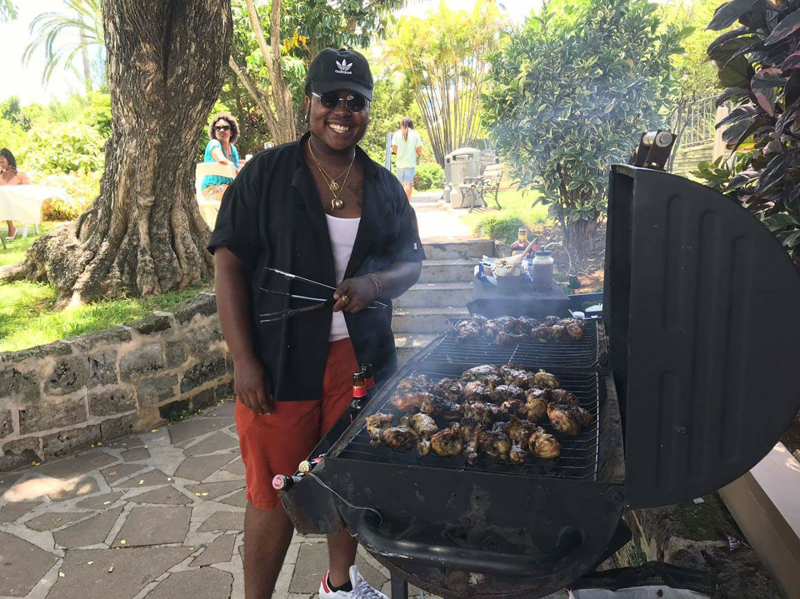 Jai Trott, a young chef who describes himself as someone with “a burning innovative passion for local cuisine and local talent,” is helping to feed the minds and bodies of those around him through his business Bermudiful Mind Catering and Private Dining. “Having started off as an intern in a kitchen to now running my own, I want to inspire other locals and let them know that your dreams can come true,” he said. His inspiration to pursue the culinary arts was a passion that he had seen within himself from early on. “For as long as I can remember I always had a fascination with food and flavours. From the age of 3 I would always find a way into the kitchen when my father would cook and try to help him with the dish, which I am sure I probably over seasoned,” he said. “While attending Somersfield Academy I was given the opportunity to job shadow a chef at a restaurant at a young age. That experience alone was enough to cement my passion for cuisine. The pressure of the incoming mealtime rushes, the endless orders, the speed and precision needed was all so interesting to me and I love it. Cooking is not the only form of self-expression through which Jai captures the “Bermudiful” experience. He also writes poetry, and has begun to compile his very own collection of pieces describing unique excerpts and interpretations of the Bermuda way of life which will be entitled, “Pink Hues and Sea Glass”. When asked what the inspiration behind his poetry was, he shared, “My book of poetry started off as a useful tool to express myself in a positive way, but when I started posting some of my pieces and I noticed how influential and impactful they can be to people, I decided to make the book as an escape for anyone who doesn’t have someone to relate to. “I would have to say that life in general inspired my book, but seeing the condition Bermuda is in is what drove me to write. I was told at a young age that readers are leaders, so I figured that writers shape the mental. “On top of that I noticed that my generation of young black local boys and girls would either ignore the wisdom the elders where willing to provide us with, or just not inquire for knowledge at all. There is endless amounts of information that our seniors can share with us but they have either tried to educate us and were ignored or have lost faith in us and couldn’t be bothered to share what they know. Having such a varied set of skills and interests we were interested to know who Jai looked to for inspiration, not only as a writer but as a chef as well. “I would say as an author I am inspired by Chinua Achebe the author of “Things Fall Apart” because he had no problem tackling the problems within that society that his peers and humanity would rather ignore,” he said. Finally we asked Jai if he had any sentiments he wished to share with his Bermudian peers who are attempting to achieve their own personal goals, and he replied, “To all the young kings and queens out there I would like to say, no matter what anyone tells you follow your dreams. For more information, follow Mr. Trott on Facebook or Instagram.